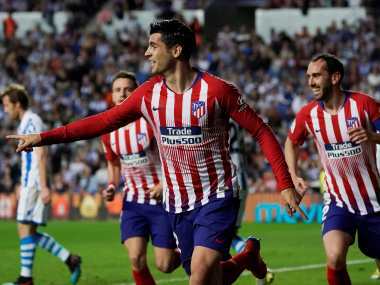 Madrid: French striker Antoine Griezmann hit a hat-trick as Atletico Madrid thrashed Sevilla 5-2 on Sunday to cut the gap on La Liga leaders Barcelona back to seven points. The result was also a boost for Manchester United, who face Sevilla in the Champions League last-16 second leg next month after the two sides were locked 0-0 from the first game. "I'm very happy with the team's work, but a little less happy that we conceded two goals," said Griezmann. "It's good that we have several forwards who score goals, but the most important thing is the three points." Former Chelsea star Diego Costa grabbed the opener just before the half-hour mark after a farcical mix-up in the Sevilla defence. Goalkeeper Sergio Rico attempted to play a short ball to Ever Banega standing on the edge of the penalty area. However, his teammate dallied too long and predator Costa nipped in to steal the ball off the toe of the Argentine before confidently burying the opportunity. Sevilla had plenty of chances with Colombian striker Luis Muriel seeing Atletico keeper Jan Oblak deny him with a smart save. Three minutes from the break, Griezmann scored his first of the night when he danced between three defenders to score with a fierce right-footed drive past Rico. 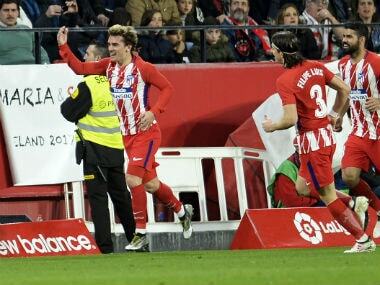 Griezmann made it 3-0 five minutes into the second half, converting his team's first La Liga penalty of the season after Costa was brought down by Rico. Sevilla imploded with Koke making it 4-0 after more suicidal defending before Griezmann completed his hat-trick on 80 minutes, taking his Liga tally to 11 for the season. The home side salvaged a degree of pride when Pablo Sarabia and Nolito tucked away goals in the last five minutes. 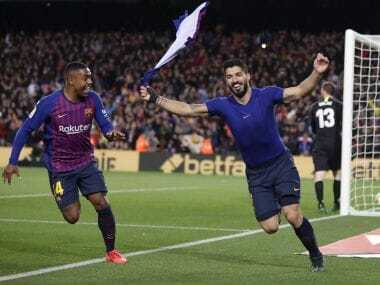 On Saturday, Luis Suarez hit a hat-trick as Barcelona thrashed neighbours Girona 6-1 while Cristiano Ronaldo scored twice for Real Madrid in a 4-0 defeat of Alaves. Real are third, seven points behind Atletico and 14 back from Barcelona. Earlier on Sunday, Santi Mina scored both goals as Valencia defeated Real Sociedad 2-1 to stay firmly on course for the Champions League next season. 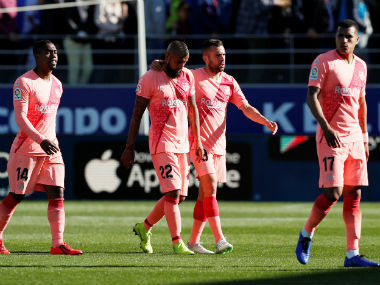 The victory took fourth-placed Valencia to 49 points, just two behind Real and eight ahead of Villarreal in the race for spots in the continent's top club competition. Valencia went ahead in the 34th minute with a Santi Mina header before Mikel Oyarzabal levelled with a powerful drive after 54 minutes. However, a mistake by Sociedad goalkeeper Tono Ramirez 13 minutes later allowed Mina to tuck away the second goal and ensure the three points against rivals who were eliminated from the Europa League on Thursday at the hands of Salzburg. Athletic Bilbao came from a goal down to defeat rock-bottom Malaga 2-1 on a roller-coaster day for Moroccan international striker Youssef En-Nesyri. 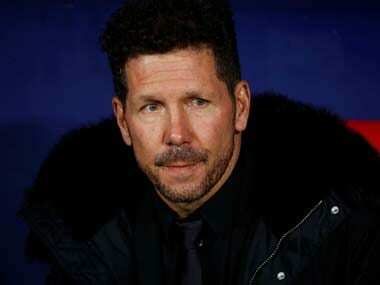 The 20-year-old gave Malaga a 12th-minute lead, finishing off a cross from the right-hand side. Markel Susaeta levelled five minutes later before a half-volley from Mikel San Jose secured the win for Athletic just before half-time. En-Nesryi then missed a penalty on the hour when his spot-kick was saved by Bilbao goalkeeper Kepa Arrizabalaga. His frustrations then got the better of him when he was red-carded six minutes from time after picking up a second booking. Villarreal goalkeeper Sergio Asenjo saved two penalties as his side beat Getafe 1-0 to consolidate their push for European football next season. Turkey international Enes Unal scored the only goal at El Madrigal after just three minutes and Asenjo preserved the lead by saving a first-half spot-kick from Angel Rodriguez. The 28-year-old then kept out a Jorge Molina penalty on 51 minutes to allow Villarreal to climb above Sevilla into fifth after halting a run of three league matches without a win.